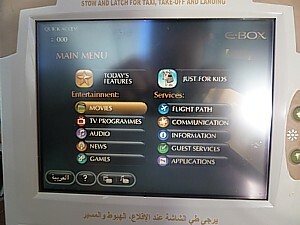 Etihad has two different styles of seatback TV inflight entertainment system – however both are called the E-Box, and both feature AVOD (AV on demand – you can start and stop films when you want). 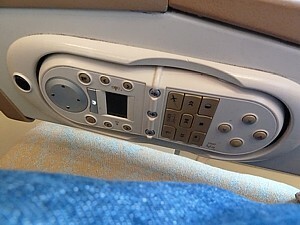 Virtually every Etihad aircraft has a seatback TV system. All of the longhaul fleet have seatback TV, and a few of the shorthaul A320 fleet. 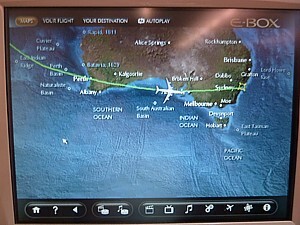 The most common inflight entertainment system on Etihad is the Panasonic eX2, which is fitted to almost all of Ethiad's Airbus aircraft, and the Thales TopSeries i5000, which will be fitted to the A380. 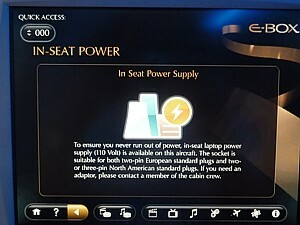 All Business and First seats, and most seats in economy, have a Plug-And-Play system. That USB slot isn't just for charging your tablet: you can use it to play media on a USB stick too, and there are even video input (phono) sockets in the seats up the front. The Airbus A330s, Airbus A340s and Boeing 777-300ER all have an in-flight telephone via satellite, and you can Email or Text from your seat too: Alas there is no inflight web browsing as yet. Which means it is a real shame that the Etihad IFE system is a bit of a negative about the airline – it should be good, but it is really only just OK. The user interface to the Panasonic eX2 AVOD system is just woeful, with controls on the remote totally un-intuitive. To make it worse, it is clunky and slow, with a massive delay between pressing a button and anything happening. Annoyingly, there is a series of trailers before every film and TV programme. It is impossible to skip these (unlike on say Singapore or BA), and they last for six minutes (a 2 minute trailer, 2 minute advert, and a 2 minute ode-to-joy about Etihad and why its IFE is so good. Which it isn't). All this before a 10 minute news summary. It is as badly designed as the user interface. The TV screens are large and brand new on Etihad, with a TV screen size of 23 inches in First, 15 in business and 10 inches in economy. However in First you sit so far away from the screen it's hard to see it, and the screen doesn't tilt except in economy. If the blinds aren't down, you can't see the screen. Etihad TV programming doesn't start until the plane is in the cruise, and is turned off an hour before landing, when headphones are collected: if you like to watch a lot of films, there are better airlines which leave the system on all the time. And then – when you are ranting about all this lot – there is the choice of programming. Talk about bland, uninspired, and just plain dull. There is a lot of quantity there – just not much quality. There are half a dozen Hollywood films which are current releases, a huge rack of sunk without trace 'recurrent' films from the past few years, and a few golden oldies in-case you get desperate. There are no especially interesting films or documentaries, nothing controversial, nothing adult, no obscure foreign language films. If you want something thinky in the movie department, you're out of luck. Then again, the TV programming is worse, with just wall to wall US TV series, and little from elsewhere in the world in the English language. In First Class you get a vast 23-inch TV screen, which while great for watching films if you lean forward, is screwed to the cabin wall and doesn't tilt. It's fine, but you end up watching it from far away and bolt upright, from where it has the size of a 12 inch screen close up. 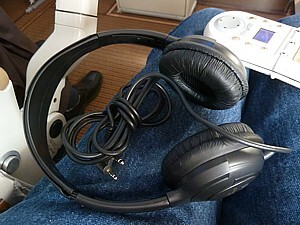 There are very good noise cancelling headphones with two pins in First – they are in a small cupboard which also has an AC power socket (110v with all plugs including UK/Hong Kong/Singapore), a USB power socket which doubles as a media player socket for USB sticks, and three network ports (but these do nothing). On Etihad in Business Class you get a 15.4 inch seatback TV, which doesn't tilt like it's First Class cousin, but at least you are closer to it. The remote control is in the arm wall, but it has a commonly designed (and stupid!) user interface which does nothing to skip the six-minute series of adverts before everything you watch. Etihad business class headphones are pretty standard overhead band type noise cancelling headphones with two pins (3.5mm & 2.5mm jacks). They aren't top notch, but reduce engine noise well. Alas they can't do much about the noise of the crew chatting in the galley. Every seat in Economy Class on Etihad gets a 10.4 inch seatback TV with AVOD. The remote for this is in the seatback in front, unless you are in the bulkhead or emergency seats, when it is in the armrest in the most annoying position possible, where you will always lean against it and bang the buttons. The only solution here is to drag it out of its holder and wedge it down the side/front of the seat. Headphones in economy class are basic overhead band affairs, with twin jacks; at least they have stereo sound. The crew collect these at least an hour before landing, and refuse to let you hang onto them – not that there is much point as the AVOD system is turned off anyway. 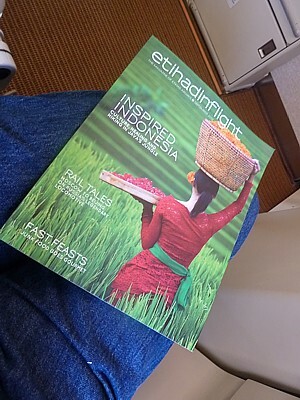 Etihad has a pretty standard inflight magazine called, very conventionally, Etihadinflight. The front cover is in English, while the back cover, and read back to back, is in Arabic. Therefore all the really intersting stuff light the route maps and the fleet information is in the middle, along with Inside Etihad which has some genuinely interesting things to say about the company. No, really it does. Etihadinflight has a kind of cheap, giveaway paper quality, and it feels a bit 'thin', but ther are some relatively well written articles, mainly travel and food related. The Local Colour section at the front of the mag has a good calendar of events around Etihad destinations. It is produced in Abu Dhabi by the mainly UK editorial team at ITP. All reviews and opinions on Etihad food, service, seats, planes, upgrades, lounges, and the Frequent Flyer scheme are given as a personal opinion. No legal liability is accepted if you take my advice.